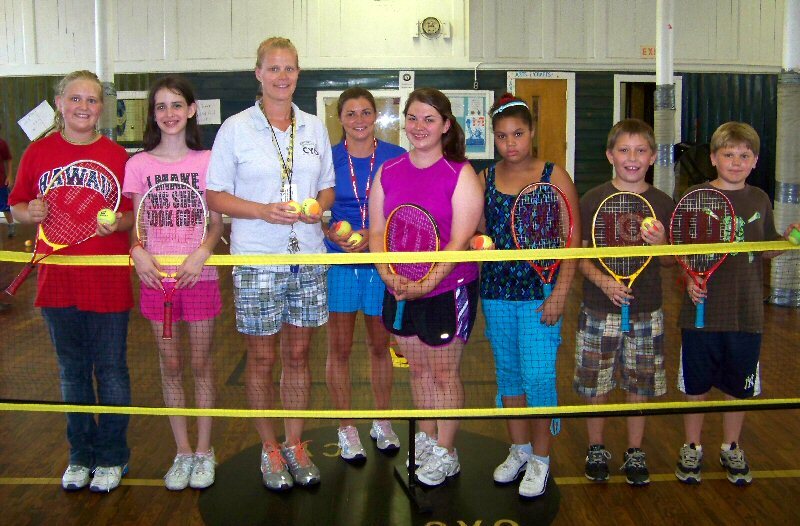 Fulton, NY – Participants in Catholic Charities of Oswego County’s CYO Summer Drop-in Recreation Program, take a break from their tennis lesson. 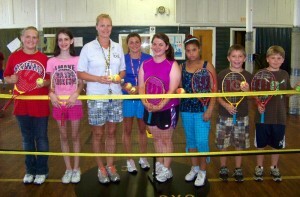 AmeriCorps Members, Leigh Bergman and Morgan Mears visited the CYO to offer instruction on the game of tennis. The CYO Summer Drop-in Recreation Program is offered free of charge to children in grades 2 through 8 in Oswego County and is held Monday through Friday, 9 a.m. to 3 p.m.
From left are: Caitlin Wisniewski; Tiffany Ditton; CYO coordinator, Stacie Roberts; AmeriCorps members Morgan Mears and Leigh Bergman of the USTA Summer Tennis Program offered through the Oswego City / County Youth Bureau; Tanique Brooks; Owen Ayotte and Devon Frank.